The Division of Noninvasive Cardiovascular Imaging provides comprehensive state-of-the art imaging of the heart, arteries, and blood vessels using high resolution Computed Tomography (CT) and Magnetic Resonance (MR) advanced imaging technologies. These technologies allow our physicians to perform noninvasive imaging and provide accurate diagnosis of diseases affecting the cardiovascular system. We work closely with our colleagues in Adult and Pediatric Cardiology, Vascular Surgery, and other medical and surgical specialties and subspecialties to deliver the best possible imaging services and overall care. Imaging examinations are tailored to answer specific clinical questions, optimize imaging utilization, provide expert interpretation, and ensure patient safety. Consultative services are also provided for difficult cases requiring a comprehensive treatment strategy. The Division of Noninvasive Cardiovascular Imaging is proud to provide an exceptional level of service to all our patients and referring physicians. In addition to providing outstanding service, our physicians help ensure that each patient has a positive overall experience while in our care. Referring physicians who send patients to us can expect to receive thorough, high-quality radiology reports in a timely manner. 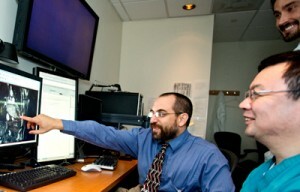 Our physicians are readily available to discuss results and imaging needs.